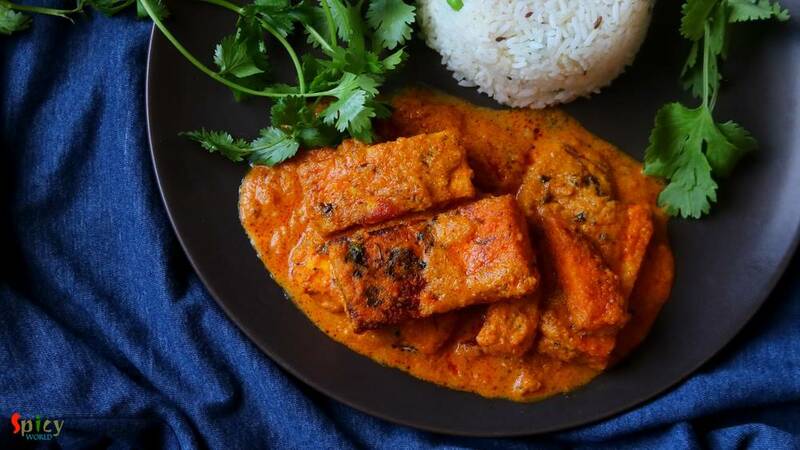 Paneer Butter Masala has a thick, creamy nut, onion and tomato based sauce with some juicy and lightly fried paneer pieces, also the rich gravy has an aromatic flavor of butter and kasuri methi (dry fenugreek leaves). Those who had 'dhaba' (street side food joints of India) food once in their life knows that no restaurant can replicate their rustic yet delicious taste. 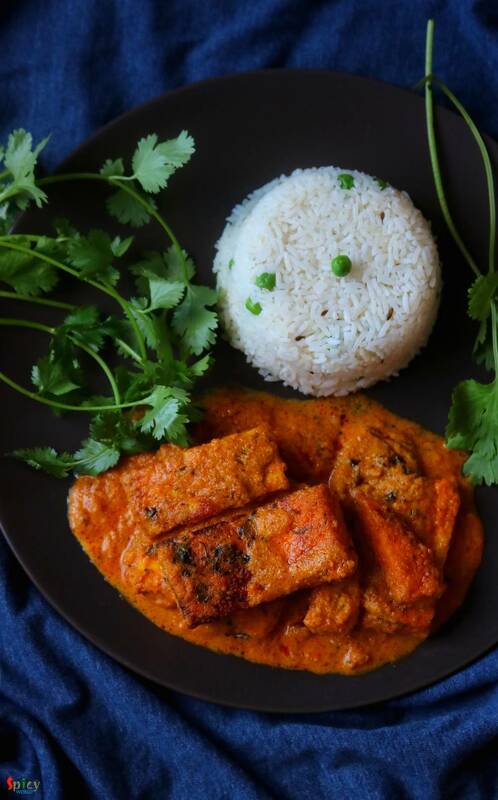 Dhaba style paneer butter masala can be served with butter naan, jeera rice, lachha paratha or plain chapati. 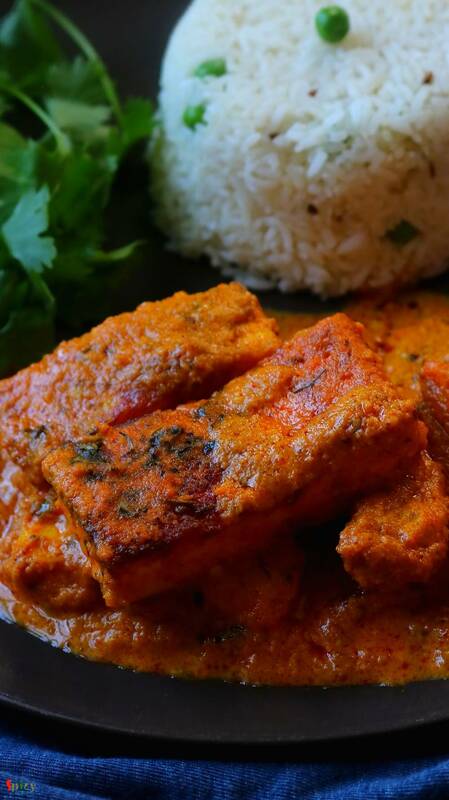 15 pieces of thick cut paneer. 1 large onion, roughly chopped. 7-8 pieces of cashew / almond. 1 Tablespoon of ginger, garlic and green chili paste. 2 Tablespoons of condensed milk. Spice powder (1 Teaspoon of turmeric powder, 1 Teaspoon of red chili powder, 1 Teaspoon each of roasted cumin and coriander powder). 2 Tablespoons of crushed kasuri methi or dry fenugreek leaves. Half Teaspoon of garam masala powder. 3 Tablespoons of heavy cream. 6 Tablespoons of vegetable oil. Half cup of warm water. Heat 2 Tablespoons of oil in a pan. Add green chilies, fry for a minute. Then add chopped onion and fry for 3 minutes on high flame. Add tomato, some salt and cashews. Cook until they become soft. Now transfer the masala in a blender along with little water. Blend it to a smooth paste and keep it aside. In another pan, heat the remaining oil. Add the paneer pieces and fry for 1 minute, then flip it to the other side, again fry for a minute. Take them out in half bowl of warm water. In the same pan and oil add 1 Tablespoon of butter then add ginger, garlic and green chili paste. Cook for a minute on low flame. Now add all of the spice powder and 1 Tablespoon of kasuri methi (rub within your palm before adding). Mix well for a minute on low flame. Add the onion tomato paste and cook for 8-10 minutes on medium flame. Then add salt as per your taste and the condensed milk. Cook for a minute. Now add fried paneer along with the water. Mix well and cook for 4-5 minutes on low flame. If the curry becomes dry add little warm water. Lastly add garam masala powder, heavy cream, the remaining butter and kasuri methi. Mix well and cook until the gravy becomes thick. Let it rest for half an hour then serve. 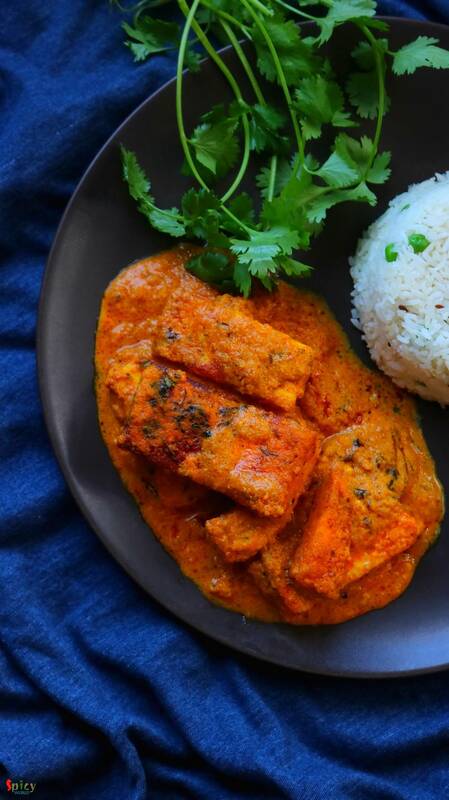 Your dhaba style paneer butter masala is ready to serve. Serve this hot with jeera rice, butter naan, lachha paratha.